But how? I’m just a vessel of clay. What if I try and then I fail? What if there’s suffering along with this gale? But I’m just a vessel in desperate need of keep. Am not promised victory just because I try. How will I ever then answer this call? But so often I seem to just fall on my face. It’s not up to me, this isn’t my fight. 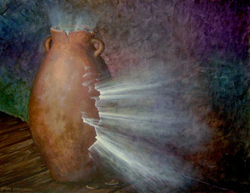 To glorify yourself through this cracked vessel of clay. Thank you for your comment Kathy and for sharing your heart in it. I think you’ve captured the heart of what I wrote very well. Thank you for your faithfulness and your willingness both to serve and continue. God is working through your life big-time. This is what has been on my heart for a while now. Before I started working with the VBC children’s ministry, I could hear God whispering, “Will you still do this even if you know you will fail?”. I wrestled with that for a while. I never go into anything, if I think I will fail. I am usually pretty aware of my limitations & I don’t venture too far outside that area. Was God expecting me to fail? After a bit more experience this year, I believe it was a test of my focus. Do I focus unnecessarily on MY need to succeed? Do I? I know what I should be focusing on, but have I been? I know it’s not about me. If my focus is on me & what I have accomplished, then failure will come eventually. I will disappoint someone. Someone will get mad at me. Etc, etc… What I need to remember are God’s promises. There may be tumultuous times – He will give peace. I will err, He is perfect. The outcome isn’t mine, It’s His! This is my training ground. This is our training ground. The outcome will not be what I expect, but it will be what He expects. Life is messy. Only by His grace has He allowed me to be a part of His plan. So yes, I will continue to serve Him whether I “fail” or not. If I keep my eyes on Him & keep my heart pure then I will succeed because I know He is the ultimate Victor!